We were both up early so managed to pack up, clear up and saddle up by 9am. We stopped for a refreshing tea/coffee in Muchelney. 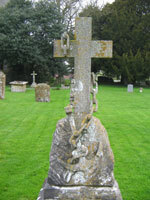 Someone was busy in the church so I just wandered round the graveyard – found an odd gravestone with a chain and anchor on it. Also found Muchelney Abbey, which I’d never heard of – it’s just over the wall of the churchyard. Mirinda wandered up and down the main street to determine that we didn’t want to move there given the traffic. We then stopped at the Countess Services just before the A34. Then it was a nice easy run home. In fact the entire run had been easy (as long as you weren’t heading in the opposite direction to us and going by Stonehenge). We were home in plenty of time to unpack then go and rescue the dogs. We had a great time, though the weather was very changeable. 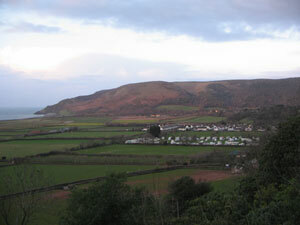 The main thing that impressed me was how nice all the people of Porlock were. No matter what they were doing or who they were, they never failed to smile and say hello. A very friendly place and somewhere I’d not hesitate in referring or returning. A big improvement was the fact that I typed up each day rather than write it in longhand. This means my poor readers do not have to wait 6 months to find out about holidays we’ve forgotten about!